Unfortunately, the dress you are looking for (Style: DJ-A4224, Name: DJ-A4224) is no longer available. Open back short print homecoming dress. 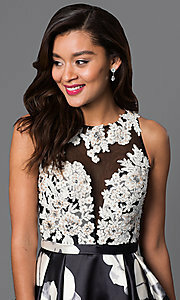 Print, Lace Bodice, Open Back, Bra Cups, Please Note: The placement of the pattern on the dress may be different than picturted due to cutting.